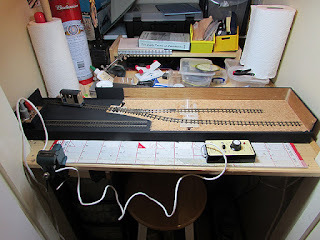 Some 16.5 mm gauge track to at least allow rolling road block testing (using DCC Concepts rollers). A length of un-ballasted 9 mm gauge track to allow rolling road block testing. Low-key scenic treatment on part of the board to use for photographic purposes. The ability to shunt a few wagons about as the mood takes. 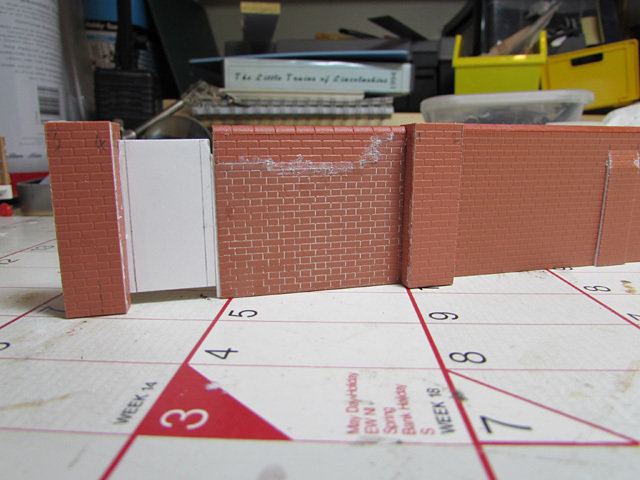 I have also made some progress on a brick wall to sit along the back right-hand end. Having had a wander around the canalside industrial area behind my workplace and taken a few reference photos on my phone (backed up with Google Earth) I had a good idea of what I wanted to build, I wanted a bricked-up gateway with a replacement smaller gate, plus a length of buttressed wall to the side - I didn't want a plain wall as it would be one of the main features of the scene. The pillars of the gateway are built from a plain bond in order to make the corners easier to match up. The infill section was recovered from the first attempt at the wall, but altered to incorporate a rebuilt upper section to add interest. Capping is from the Wills 4mm scale roof/guttering pack. 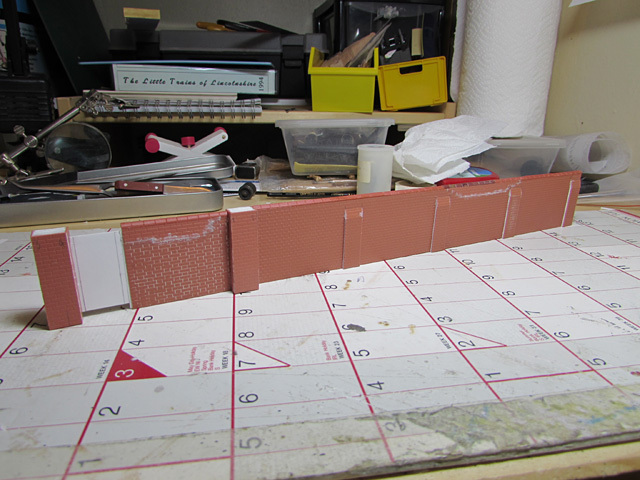 Further along the wall is the buttressed section. The buttresses are an overlay with a 40 thou piece of styrene behind, the top is tapered in to a slot in the brickwork. The sides of the buttresses have the brick courses scribed in. 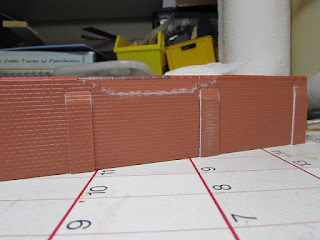 Again, there is a repaired stretch of wall along the top, capping is again from the Wills pack, the original capping is assumed to be the triangular pattern, the replacement is rounded. The Beck Bridge II - Rethink!